If you guessed: Donatella Versace, Karl Lagerfeld, and Betsey Johnson, you're right! Check out The Gloss for a gallery with close ups of each of the designers in their fully frosted glory. 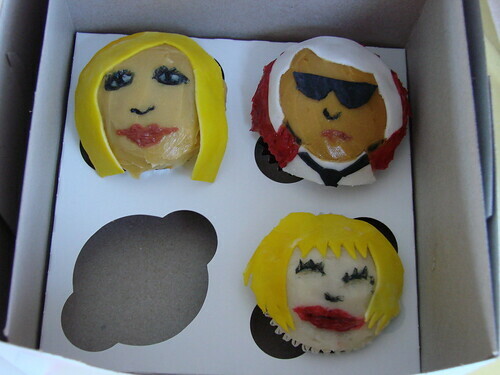 Dear Blondie&Brownie, these designer cupcakes are incredible! What inspired you to do this? So original and they look just like the designers, especially Lagerfeld. Thats a wonderful shot of the cupcakes as well. Very professional and I will definitely be back to have a bite of more.